Here's another chance to win! 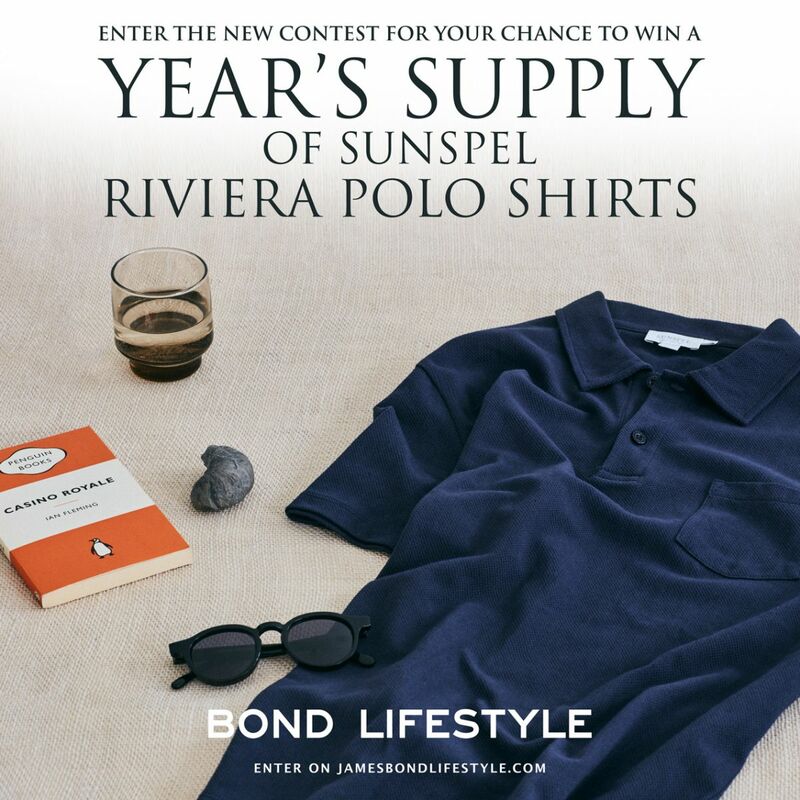 Celebrating the launch of the new Sunspel Ian Fleming™ collection, Sunspel and Bond Lifestyle offer you the chance to win a year's supply of Sunspel Riviera Polo Shirts*! Answer the trivia question before midnight on April 22nd 2018 for your chance to win. Sunspel's connection with James Bond started in the movie Casino Royale (2006) in which Bond wears a navy Riviera Polo, a White V-Neck T-Shirt and a Grey Melange Crew Neck shirt (read more). The Riviera polo, a Sunspel icon since the 1950s, was reborn in 2006 when it was tailored for Daniel Craig as Bond. The Sunspel Riviera Polo is currently available in a wide range of colors. For the new Sunspel Ian Fleming™ collection, Sunspel pays tribute to Ian Fleming's love of Sea Island cotton. James Bond creator Ian Fleming was a devoted fan of Sea Island cotton. He frequently wore the fabric during his time at his GoldenEye villa on Jamaica where he wrote the Bond books, and often dressed his literary creation, James Bond, in it too. In homage, Sunspel and The Ian Fleming Estate have come together to produce a range of menswear made from the same rare material. The Sunspel Ian Fleming Collection includes Sea Island cotton shirts and Sea Island Knitted jumpers and cardigans. Read more about the collection here or shop the collection at Sunspel.com. Answer the trivia question below before midnight (CET) April 22nd 2018 and fill in your name and email address for your chance to win! * A year's supply is defined by 1 polo shirt for every month. The winner will receive 12 Sunspel Riviera cotton polo shirts in different colors from Sunspel's range. Entry is open to participants from all over the world. Only 1 winner will win the year supply of Sunspel Riviera Polo Shirts (this means a total of 12 cotton polo shirts in different colors). The winner will be drawn at random from all correct entries received by the closing date stated within the promotional material. Reasonable efforts will be made to contact the winner. If the winner cannot be contacted, or is unable to comply with these terms and conditions, Bond Lifestyle reserves the right to offer the prizes to the next eligible entrant drawn at random. Prizes are subject to availability. In the event of a prize being unavailable, Bond Lifestyle and Sunspel reserve the right to offer an alternative prize of equal or greater value. The winner agree(s) to the use of their name and disclosure of country of residence relating to any post-winning publicity. The winner is responsible for expenses and arrangements not specifically included in the prizes, including any import taxes or duties. In the 2006 movie Casino Royale, James Bond and Le Chiffre play high stakes Texas Hold’em poker. In the original 1953 Ian Fleming novel, they play a different game. Which game? The winner of the year's supply of Sunspel shirts is Don Ludwig from Boston, USA. Congratulations! Didn't win? Enter the new N.Peal contest for your chance to win one of the two Fine Gauge Moch Turtle jumpers.